Hi gals! I have some super exciting news! 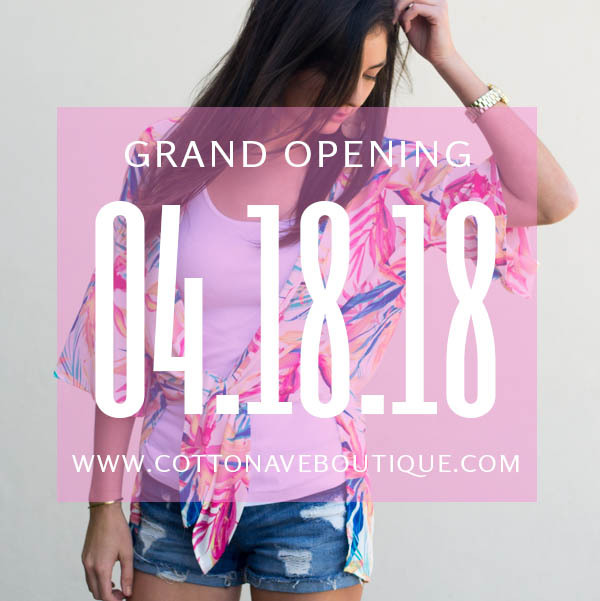 I am launching an online women's clothing boutique, Cotton Avenue Boutique! My goal for Cotton Avenue is to be a store where you can buy cute, trendy, and affordable clothing all in one place! Our spring collection will be launching on Wednesday, April 18th! Expect to see a lot of bright and vibrant colors, as well as tons of florals! See some sneak peeks from our collection below! We will be giving away four $25 gift cards on our social media pages leading up to the launch, so make sure to follow along for your chance to win! Instagram - There's one going on now! Also make sure to join our mailing list by entering your email in the popup on the Cotton Avenue website to receive 10% off your first order! I am loving the Spring collection! So many cute pieces! I love the bold colors and fun prints! That second dress is lovely. These pieces are so cute! I'm loving the mix of bright colors in that maxi! How exciting! Everything is so cute, I really love that floral dress!! SO many cute pieces! I love all the bright colors. This is exciting. All pieces are beautiful. I love that cute floral dress! Congratulations! This boutique looks lovely and I just love the clothing - so cute! These are all so cute!! I am loving the pink and blue dress and the pink romper! I love the pink romper! Such cute clothing selection! Congratulations! I'm excited for you! These pieces are absolutely beautiful! I love how light and airy these all are which make them so much fun! Congratulations on your new store!!! So exciting! These pieces are so adorable. I love how they are so girly and fun. ❤️ Here’s to you succeeding wildly!! OMG everything is so cute! I can't wait to shop it all - so perfect for summer! Congrats on your new boutique! The pieces are so cute. So fun! Congratulations gal!!! Very excited for you.